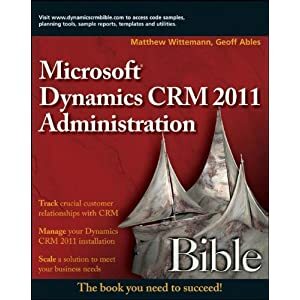 Microsoft has released a user's manual for Microsoft Dynamics CRM 3.0 Small Business Edition (which can also be used for the Professional Edition, since they are the same for the most part). It can be downloaded here. The user's manual is 124-pages long and covers sales user training, service cases and contracts, marketing and more. It looks to be quite comprehensive and is designed for a classroom/instructor-led setting. Happy reading! Thanks a lot man. I was wondering about the configuration guide for e-mail router. Is it the same as it was in pervious versions. You're welcome. The email router for version 3.0 has been changed completely. See the implementation guide and the newsgroup for more info. I found your Blog and I'm kind of interested in CRM3.0 as I do work with it know for testing purposes in our company. I red the manual you linked to, a very good and helpfull tip!! But now a little question from my side if possible? - What about this faxrouter, is it standard installed, do I just have to set it up right, or is there some installation to be done before I can use faxing possibilities in mscrm3.0? The ability to fax directly out of CRM 3.0 is available only in the Small Business Edition. It takes advantage of Small Business Server's faxing service. You will need a modem on your server as well. No additional configuration should be necessary as long as your fax service was working prior to your install/upgrade to CRM 3.0. Hi, hope you can help, I read your comment about faxing, I have latest version of CRM3 and have set up the fax option as you have suggested. The Fax works fine however I can't get a record of the sent fax into the account or contact any ideas.